We took Oscar to the vet for the first time, and he had a great checkup! Before we decided to get Oscar, I called around to make sure there was a veterinarian in our area who specialized in mini pigs. It was a little awkward for the times when I called and asked, “Do you treat miniature potbellied pigs?” and the person on the other end of the line hesitated for a while and said no. But, when I finally found one and they seemed eager to meet our future pig, it was a huge relief and worth the effort of calling around. A week after we picked Oscar up, I took him to that vet for a basic checkup to make sure he was in good health. I was worried he would squeal in the waiting room, but he actually fell asleep in his crate and only awoke occasionally to make snorting sounds. A few people there with dogs asked, “Is it okay if I ask what kind of animal you have in your crate?” and I was more than happy to answer their questions about my little guy. 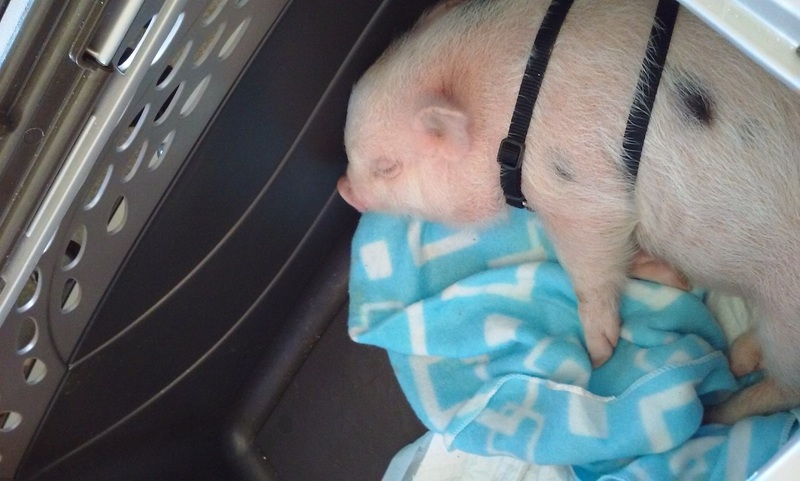 Also, this vet visit is when I decided I had the best mini pig crate because I could open the top and let people see him without risk of him running out of the front-opening door. Aside from some anticipated squealing during the exam, Oscar was great during the visit. The vet was so helpful and answered all of my nervous first-time pig mom questions (I had a ton after just a week!). I’ll admit I was relieved that the veterinarian was helpful and friendly because we have limited mini pig vet options in our area! I didn’t get a height on Oscar at this visit because he was nervous and squirmy, but he weighed in at 7 pounds at 6 weeks old. He was so tired after his first vet visit, but I was happy to know I had a healthy boy! how much does oscar weigh now?